Plants are the Strangest People: Anthurium no. 0510 "Victoria 'Porkchop' Parker"
Anthurium no. 0510 "Victoria 'Porkchop' Parker"
I have wondered, from time to time, why professional Anthurium breeders aren't spending more time focusing on foliage. It's easy enough to find variegated leaves on foliage Anthuriums like A. hookeri (also similar-looking but unidentified plants here and here), and of course there are A. andreanum hybrids with speckled spathes, like 'Peppermint Gemini,' but I've only ever been able to find one A. andreanum hybrid with variegated leaves, via davesgarden.com, and I'm not sure that it's variegated on purpose -- there's no cultivar name given,1 the pictures are terrible,2 and I've never seen anything like it for sale. 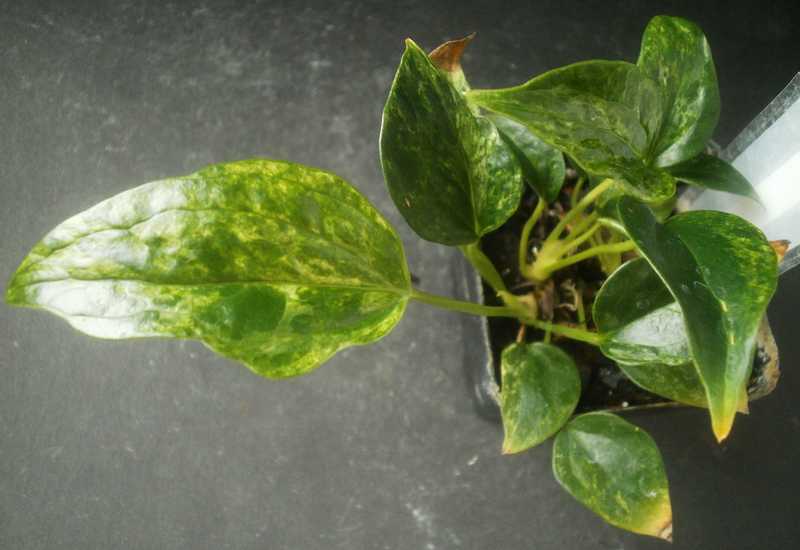 Anthuriums do occasionally wind up variegated due to viruses; this conversation at aroid.org mentions dasheen mosaic virus3 specifically, but obviously this is bad for the health of the plant, and of other aroids that happen to be near the plant, and there's no cure for it. The aroid experts in that thread say plants with dasheen mosaic virus should be destroyed, so as to prevent it from being spread to other plants. Which brings us to 0510 "Victoria 'Porkchop' Parker." Note: all photos of 0510 have had the color exaggerated somewhat in order to make the shape of the variegation clearer, and to make it easier to see variegation through the light reflected at the camera by the leaf surfaces. In person, the color contrast isn't anywhere near as dramatic, though it's easier to see through the reflections. So: the photos aren't accurate, but they still roughly approximate what you'd see in person. 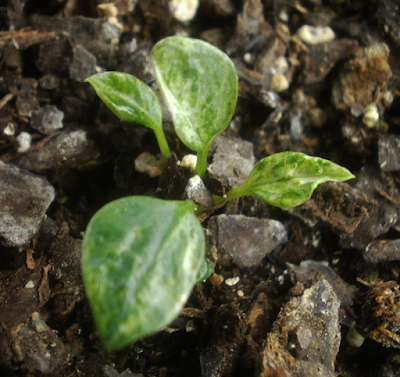 Victoria has been producing mottled leaves since germination, and was actually one of a quartet of plants from the same sibling group4 that did so. 0405 "Crickett Bardot," 0509 "Felicity Charmichaels," and 0522 "Brandy Sheena Gunn," from the same sibling group,5 also had spotty, variegated-looking leaves, and while Brandy was always kind of sickly and eventually died, and Felicity lost the variegation with age, Victoria seems to be strong enough to continue to grow slightly variegated leaves, the most recent of which is in the photo above, and Crickett, though less vigorous, produces leaves which are thoroughly mottled. 0509 "Felicity Charmichaels" as of 17 March 2014. I would have added a more recent photo of Felicity, but -- she still looks like this except for the color, which is now uniformly green. The entire plant is only about an inch, inch and a half (2.5 - 3.8 cm) across. Not different enough to be worth a photo. 0405 "Crickett Bardot" on 25 July 25. 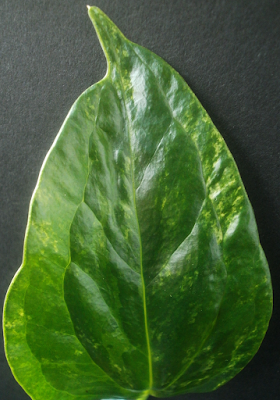 Similar variegation pattern as Victoria's, but all the leaves are still pretty small. 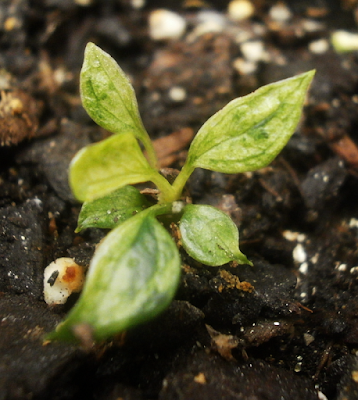 I came this close to moving Crickett into a larger pot last week, out of curiosity about what would happen, but there were other seedlings that seemed to need / deserve it more. I wish I had space to up-pot all the seedlings whenever I want, but alas. I had zero familiarity with dasheen mosaic virus before I started writing this post. 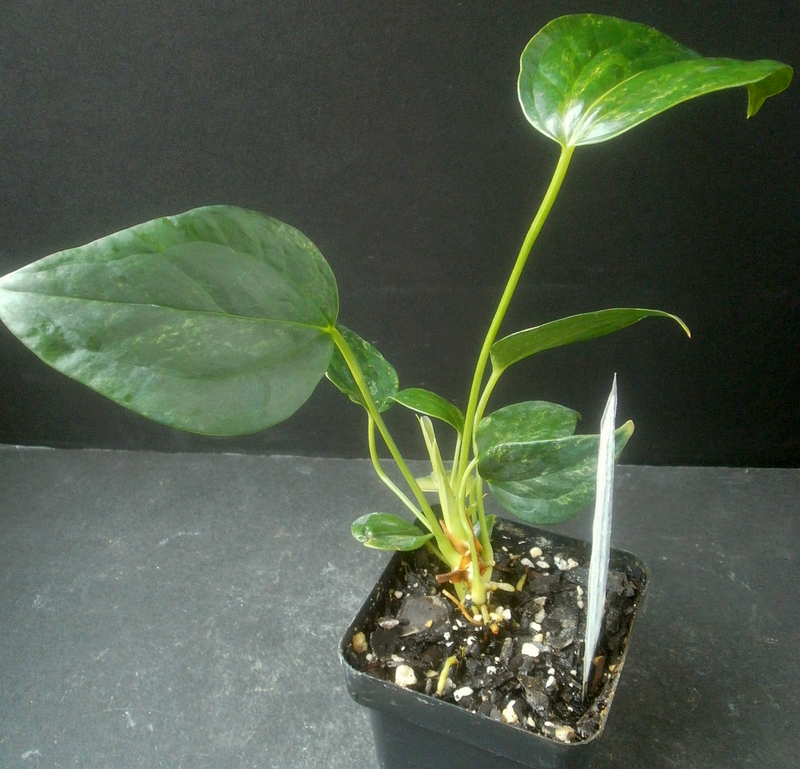 The best photo I could find of DsMV on an Anthurium andraeanum hybrid looks like this, which is sufficiently unlike my plant that I'm sort of inclined to think that that's not what's happening with Victoria,6 but I'm not a plant virus expert or anything. DsMV is spread through insects. Outdoors, that's usually aphids, though I imagine thrips could do it as well. 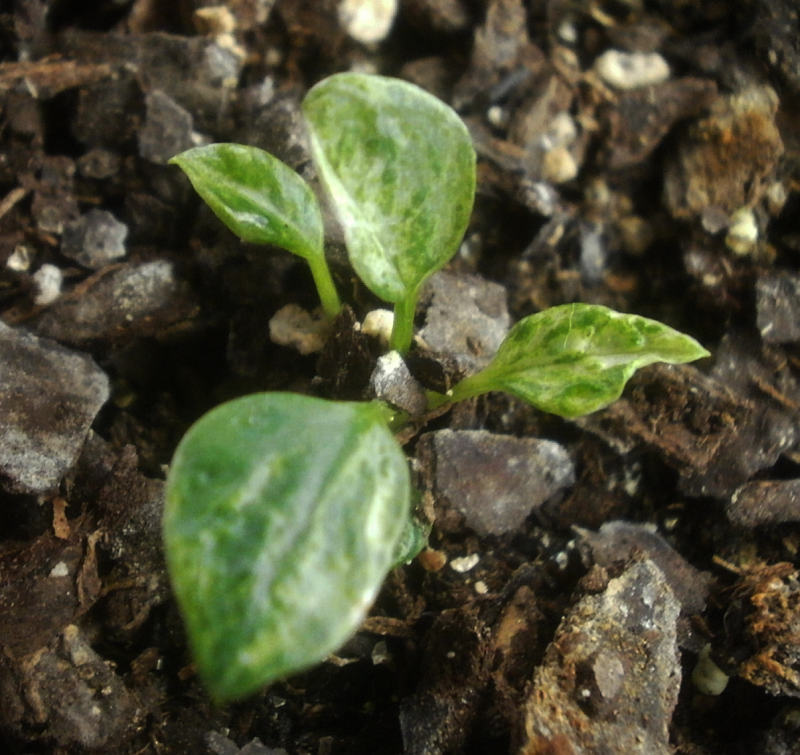 And if this is a virus, and thrips can spread it, then I should probably just assume that all my Anthuriums are infected even though only three of them have ever shown any signs of infection. On the other hand, maybe it's not a virus. Maybe it's just variegation. In which case . . . still not that impressed, really. I mean, it's subtle enough to be hard to photograph, and even in person it's not what you'd call pretty. 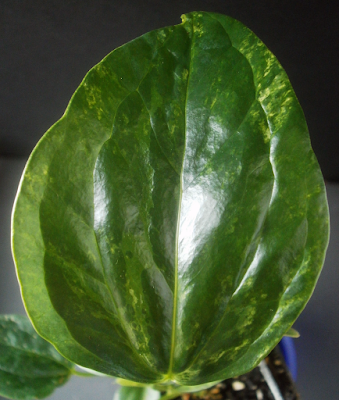 Maybe that's why nobody bothers with variegated Anthurium foliage: even on the rare occasions when you get it, it doesn't really add anything. Or maybe perfectly lovely variegated Anthuriums have been tried and customers just didn't like them: customers do have notoriously awful and/or boring taste.7 Even if it's not possible to do variegation well, I still think there must be something else to be done with Anthurium leaves. We have plenty of neon yellow aroids: Epipremnum aureum 'Neon,' Philodendron 'Moonlight,' Spathiphyllum 'Golden Glow,' Philodendron hederaceum 'Aureum'/'Lemon-Lime,' Xanthosoma 'Lime Zinger,' Syngonium podophyllum gold something-something, etc. Surely it's not beyond our abilities to come up with a neon yellow Anthurium? Or what about an Anthurium that has red-brown new growth that stays red-brown? Something. I've seen plenty of variation in the shape and texture of my own seedlings' leaves, and we know A. andreanum hybrids can produce a lot of different-colored pigments when they need to; I don't think it's so outlandish to think that foliage could be a lot more diverse than what's on the market already. In any case. "Victoria 'Porkchop' Parker" is probably not the vanguard of a new era in Anthurium foliage, but she's at least something of a puzzle. And maybe I'll get answers to that puzzle someday. 1 'Variegata' could, I suppose, be an actual variety name, for some species or genera of plant, but its a very generic, well-I-suppose-I-have-to-call-it-something-and-it's-variegated-so-I-guess-I'll-just-go-with-that? sort of name for a plant as heavily bred as Anthurium, so I suspect it's not an official cultivar. 2 Sorry, photographer, but deep in your heart you know it's true. 4 This is the best term I can come up with for identifying seedlings that all came from the same seed parent and were sown close enough to the same time that it's plausible for them to all be from the same pollination. Seedlings within a sibling group are therefore at least all half-siblings with one another, and presumably some of them are full siblings. At this point there are 82 active sibling groups here, with more coming on all the time as new seedlings germinate and get potted up. 5 Group "BF," sown on October 23, 2013 from seed parent 'Gemini.' It's been pretty sucky so far; the only other seedling from BF you've met is the famously terrible 0415 "Darby Dragons". Two others have buds, but they look pretty Darbyish, so I'm not getting my hopes up. 6 The main differences, as I see them: the borders of the areas affected by the virus in the picture are smoother and more rounded than on my plant, the virus seems to be confined to a single layer of the leaf, rather than being in two or three overlapping layers like on Victoria; and the lighter-colored parts on my plant don't follow the veins to the same degree as in the DsMV-infected plant. 7 Someone is obviously buying those godawful glitter-and-spray-paint-covered poinsettias. 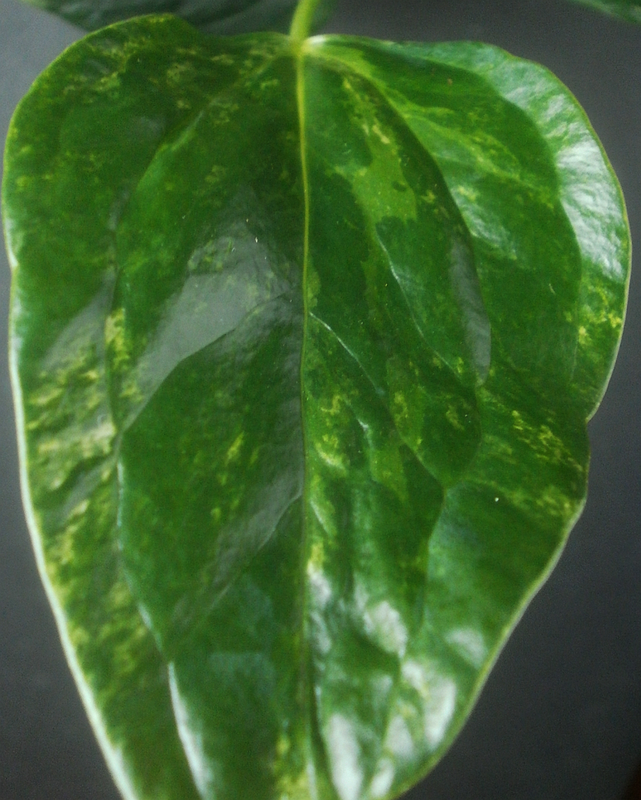 Maybe altered light conditions can bring out stronger variegation? These are typically plastid mutations, right? 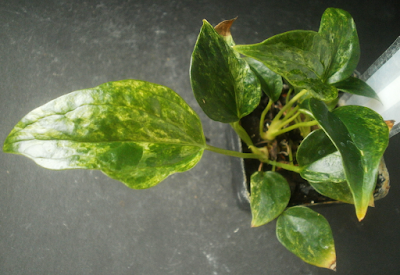 Aren't there some particularly yellow/white Epipremnum aureum that require higher light intensity to make up for lost photosynthesis? You could always send a leaf cutting in to a testing center like Critter Creek Labs and have them test for virus infection. I suppose it's possible. Victoria got moved to a larger pot recently and is now in a new location as a result, so if light intensity is relevant then we'll find that out soon. It looks like Critter Creek Labs mainly tests for orchid viruses (specifically Cymbidium Mosaic Virus, Odontoglossum Ringspot Virus, and Bean Yellow Mosaic Virus), and although their FAQ says they're willing to do tests for other viruses, it's not clear that they'd test an Anthurium. I'm in the process of asking them. Anthurium no. 0255 "Steph N. Wolfe"